It was not too long ago that consumers would make their purchases by visiting a store, browsing the chosen items and then they would make their decision based on the select options that were presented to them. Of course, sometimes these decisions would be influenced by advertisements in magazines, in television or on the radio, however, generally most shoppers would make their decision on the very little prior knowledge that they have attained about the products or options that are available to them. Today, consumers have a very different purchasing process. Most consumers will use various social media platforms to research and compare a range of products and items before making their purchasing decision and is an integral part of the purchasing process for customers today – not to mention this can all be done from the convenience of their own homes or on-the-go with their mobile device. One social platform that is leading the pack is Pinterest. So, why does your business need to start creating a presence on Pinterest? Pinterest is a site of discovery. The social channel has over 150 million active users who are on the quest to find information, advice and inspiration – that number is hard for a business to ignore. From a business perspective, Pinterest is the perfect way to have a brand’s product or service discovered by millions of users who are actively looking for things to plan, buy and do! With such a high user base, the demographics on the website are key. Pinterest has reported that 67% of ‘Pinners’ are under the age of 40 which is a 27% increase from the previous year. Another interesting statistic is that 54% of female users on the website are between the ages of 34-55 and over 35% of these users have an average household income of over $100,000. And if a brand is looking to target their male consumers, then it is worth noting that male users had grown by 120% in 2016 alone. Studies have shown that 73% of all Pinterest users have made a purchase of an item that they had found on the social channel and they have abandoned other traditional product researching methods such as magazines and catalogs. Rather, consumers are choosing to go directly to their favourite stores websites. These statistics is what makes Pinterest one of the major players in the game of digital marketing campaigns. The social channel is filled with tech savvy users who have great knowledge of the digital space with large disposable incomes. Pinterest is also a unique social channel for businesses to utilise as traditionally it is extremely difficult to sell items to those that do not want to be sold to, however on Pinterest, this is not a problem that exists. According to Pinterest, when asked who they would rather follow, weather it be their favourite brand or store compared to a celebrity on the platform, 85% of users said that they would rather follow the brand. It is because of this that Pinterest has a major influence on what consumers are buying. One of the core elements of the social media purchasing process is using these social channels to either research or bookmark their next purchases, and this is why it is so essential for brands to integrate Pinterest into their digital marketing strategies. Pinterest is so essential because they have reported that 87% of users of the social channel have purchased a product or item because of a post and a further 95% of Pinners have utilised Pinterest to plan their future purchases. If your business is not on Pinterest to promote your products or brand, you could potentially be missing out on a lot of sales. But if your brand is late to the game and has still not begun to utilise the many sellers advantages of Pinterest, then fret not! There is no better time than the present to start as Pinterest has recently developed new tools and features that will help businesses get their products found and start selling. Buyable Pins allow users to purchase your products without ever having to leave Pinterest. It is easy to spot these Pins on the platform – they can be found in search results, on your brands profile and in related Pins. If your business already has an online store that uses e-commerce platforms such as Demandware and Shopify then you are already qualified to utilise this Pinterest feature. 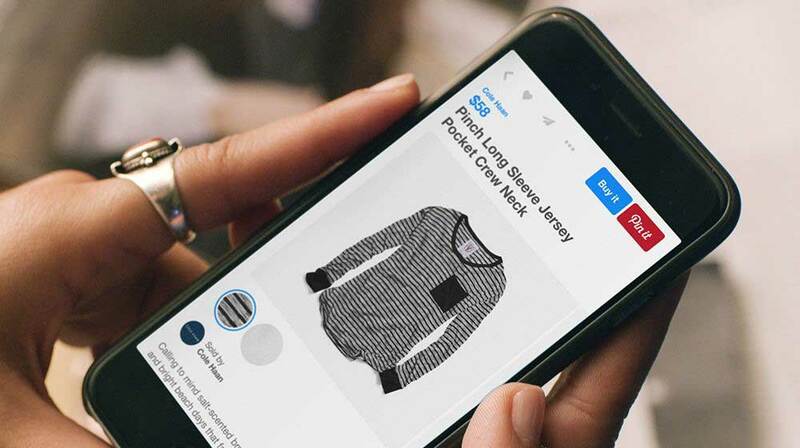 Once you have set up your account, any pins that have been created from the items that are found on your brands online store will then be marked by Pinterest with a blue “But it” or “Add to Bag” icon. The price of the item is also listed below the image. Pinterest has made it so simple and easy for their users to purchase items without ever having to leave the platform. 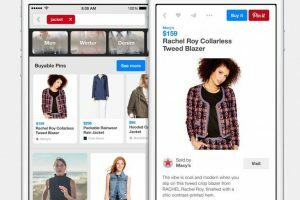 It also has the added feature of allowing their Pinners to select and add multiple items from various businesses to their own Pinterest shopping cart and then proceed to checkout on either their mobile or desktop device. Rich Pins provide the users of the platform with more context on an idea because they present additional information straight on the Pin. There are four categories of Rich Pins: app, product, recipe and article. The Pin gathers information on the images that have been pinned from your brand’s website such as real-time price information, availability, location and descriptions. This ensures that any user who pins one of your products will automatically receive the most current information on the pinned post. By connecting the Rich Pin code to your businesses Pinterest account and website, it makes pinning various products much more straightforward for your brand and your customers. Businesses can buy advertisements on Pinterest which are also known as Promoted Pins. Promoted Pins are similar to that of normal pins, however, you have to pay to have them seen by people. These pins perform better than organic pins as it increases the outreach to users. Brands can purchase Promoted Pins based on 3 various marketing goals: awareness, engagement, and driving traffic to your businesses website. With this feature, you can even select the audience that these pins will be directed to and will be the most likely to purchase your products. This can be achieved by targeting relevant keywords, their interests and even their location. This feature is extremely beneficial for brands as Pinterest has reported that more than 75% of all saved pins come directly from businesses themselves. Unlike other social channels, Promoted Pins do not interrupt, distract or frustrate Pinners, rather they assist users to find the right products and services. When a user saves a Promoted Pin, that pin then becomes visible in others feeds, which will drive more sales, particularly for new buyers. As pins on this platform do not have an expiry date, your brand’s ads will continue to come into contact with users and will continue to support your business’s goals for years to come. On average, advertisers will receive 20% more- free – clicks in the month following launching a promoted campaign with Pinterest. As Pinterest is a social platform where a brand can share their helpful and actionable ideas that can ultimately lead to large and measurable results, and with a reach of over 200 million people who come to the social channel each and every month, ready to act on the ideas and items they find, it is not hard to see why this is a desirable social platform for businesses to utilise. Utilising the tools that Pinterest offers will allow your business to get the most out of the Pinterest feed, however, there are a few things that you can do on your own to further promote your business, starting with keywords. When looking at what keywords will work best for your pins, it is important to remember that the users of Pinterest are using the social channel to conduct research on the items that they want to purchase. Use keywords and keyword groups that your brand may already be using in other aspects of your digital marketing campaign for your websites product descriptions and pins, such as your email marketing, social media marketing and SEO (Search Engine Optimisation). You can even conduct your own research by testing the selected keywords and searching for them on Pinterest. Analyse and note down what products appear when you search for these keywords and if there are any other keywords that are being used within the found pins that could potentially be added to your list. Take careful consideration when selecting the visuals that will be used on your brands website that could potentially be pinned, and for the specific pins that you are creating. Height: Images that are taller on Pinterest tend to be the most appealing for pinners as they are more noticeable on the Pinterest feed. Pinterest suggests using images with an aspect ration of 2:3. In other words, they should be at least 900 pixels high and 600 pixels wide. Colour: Studies have shown that images that have a prominent colour of red or orange receive two times as many repins than blue images. Additionally, images that contain multiple dominant colours are more popular than single dominant colour images – most receive around 3.25 more repins than the latter. Faces: Users of the social channel prefer images that do not have a face, rather, focus your images on your specific products. Images with multi color backgrounds get pinned more than images that contain a white background. Top tip: give your followers inspiration, show them the environment that your brand’s product will be used in. Now that you have all of the tools and tips you need to utilise Pinterest, you can set yourself up for success and watch your business grow.